So... This wasn't exactly planned, but now I have saltwater again! After about 3 years of being out of the hobby, I'm back. When a friend offered me his Evo 13.5 for 100 bucks fully set up I couldn't say no! It arrived tonight, with a minor gha infestation and looking kinda bad. The stock pump apparently kicked it unless I'm doing something wrong, and I also might have dropped the SG to 1.022 after it was at 1.029. Oops. So tomorrow it looks like I'll be running to the LFS to pick up a new pump and saltwater. 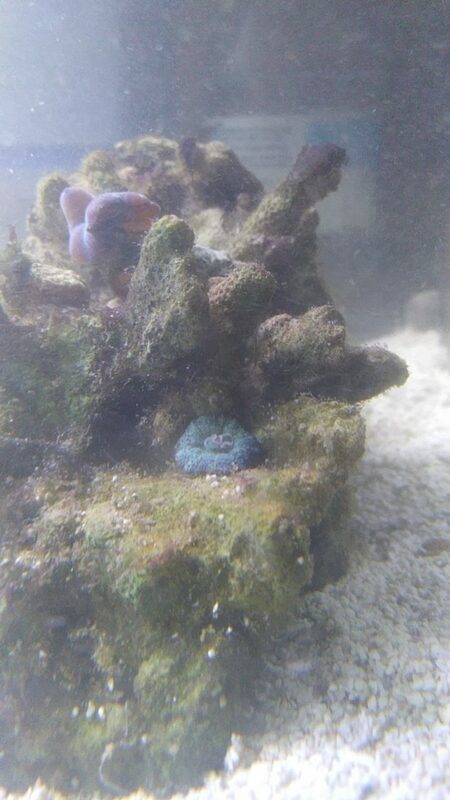 Tank currently has an emerald crab, a hermit of some sort, a damsel of some sort and a rainsford goby which was looking bad when it got to my house. Also, a partially dead gorg and some snails. I put a maxijet 1200 on it for now (good grief, it's horribly noisy!). Try to keep up with water changes for a while and you may want to get some prime if you don't have any to help with the dead and dying problem. That is a great price for a full set up. Good luck and let us know how it goes. Share some photos tomorrow if you can! When I woke up this morning, all the inhabitants minus the rainsford goby was alive and well! I went to one of the 3 LFS in the area, one that I haven't visited in a couple years to pick up a new pump. Hot dang I was drooling in there. 400 gallon display, 800 gallon display, full seahorse display (which is my dream tank), and tons of coral! Until the tank is stable I'm not going to add anything else, but I picked up a pump and koralia powerhead. They also carry Rods food, which I'm sure I'll be picking up for the eventual stock. I have to say I was a bit starstruck that @Christopher Marks commented on this lowly newbie thread. Thanks to both of you for your advice! Update: The goby is alive and kicking, I saw him out for the first time since Friday! The ammonia is pretty dang high, but my fish, inverts and gorg seem to be doing well. Eating, moving, all that good stuff. Slime algae replaced the hair algae almost overnight. Always a new battle. Congrats on your sudden and completely unplanned acquisition! 😄 Definitely an incredible bargain. 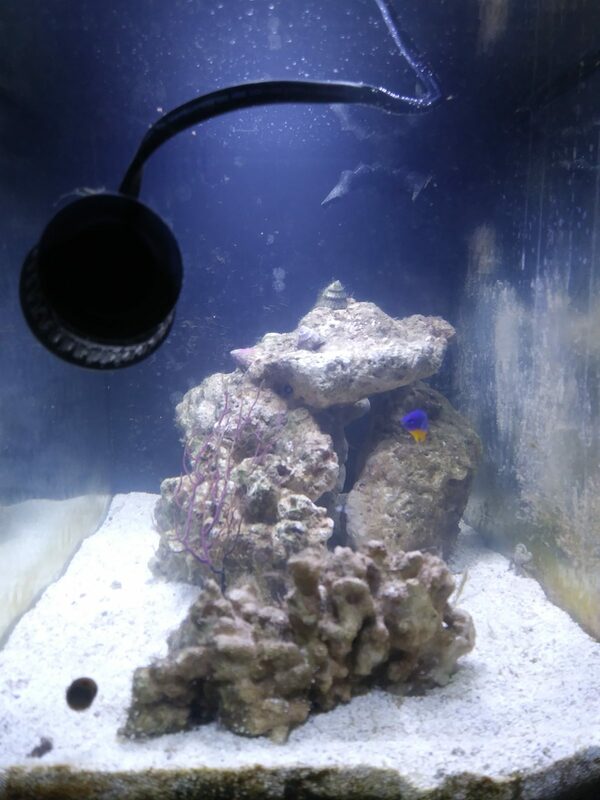 You seem like you have experience in the hobby, so I am sure that you'll turn this tank around in no time. The Evo 13.5 appears to be the go-to saltwater aquarium for many hobbyists these days, so you'll no doubt find a wide variety of information about it around here. Do you have any photos? I am curious to see what it's looking like in there. Right now it looks like a slime algae farm, honestly. Every time I change how the scape looks I don't like it, so it's forever changing. I'm thinking about removing one of the big rocks so it'll be a bit more streamlined. This is a really bad pic of the tank from the side I see it from most often. I took at trip to the LFS today... Meaning this tank got some monetary donations. I picked up some filter floss, purigen and matrix media, plus a clump of chaeto for the back chamber. Plus I added my first corals! Two shrooms, a dime sized brown and green, and a nickel sized blue. How do you have your back chambers set up? I put an eggcrate basket in my first chamber, chaeto in second, heater, ATO in 3rd. Well, I'm planning to make a media basket at some point... Right now, the purigen, matrix, and floss is stuffed into the first chamber, chaeto in the second, and heater in the third. I'm also going to eventually add an ATO. I still haven't gotten the aquascape as nice as I want it. I love my tanks clean and streamlined, as you can see in my 20 gallon Southeast Asian themed fw tank. I changed up the scape some, and I'm finally happy with it. The slime algae killed off most of the gorg, meaning it got a heavy trim. This is a bad updated FTS. 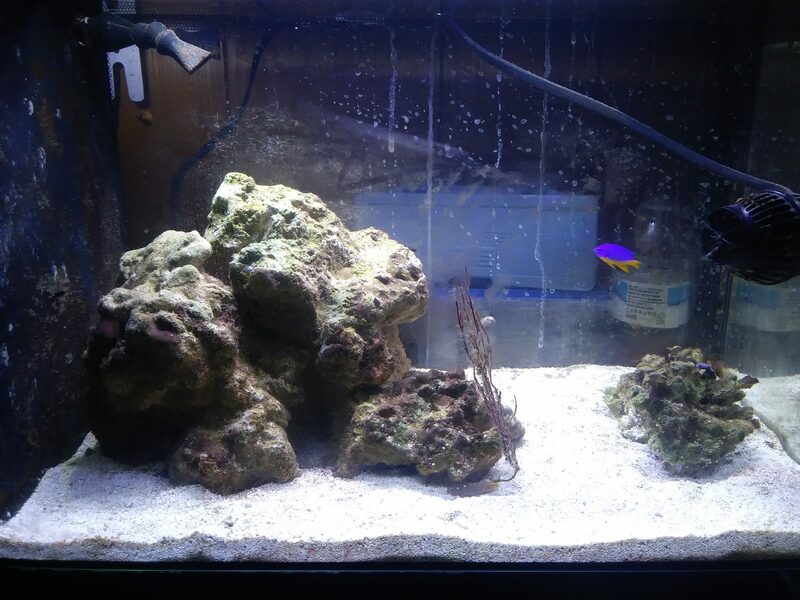 I'm thinking of adding a pulsing xenia or gsp back wall and moving the shrooms to the bottom of the main rock so something else can take the little one. I just realized I haven't exactly said where I'm going with this tank. 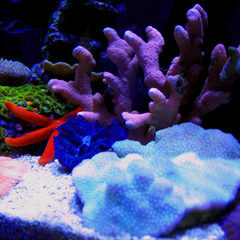 I really want to go for a softie/macro/gorg lagoon style tank. 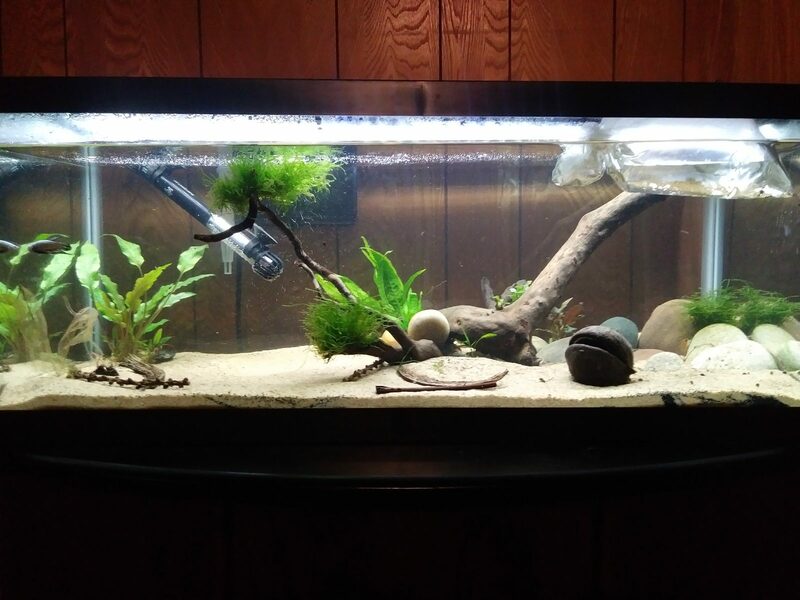 My dream has always been a seahorse tank, but in lieu of those, I'm considering trying a bluestripe pipefish, as the experts at seahorse.org say they're the most suitable and easily fed (transferred to frozen) for this size tank. It will be a significant amount of time before I actually add one. I also plan to return the damsel, as true to the rumors, he's bullying my Rainsford goby. I'm going to exchange him for a cute, tiny Redhead goby they've had for a bit. Hmm... a softie/macro/gorg-style tank you say? What a coincidence; that just happens to be my favorite kind! I'm sure it will end up looking stellar. I am really liking your 'scape too. My favorite aquariums all have a good bit of open sandbed in them. It's been a little while, with no big changes to the tank. The damsel was exchanged for a magenta shroom hiding under the frag rack at my favorite LFS. They have a large, fluffy gorg of some sort I plan to bring home some time later this week. I've noticed I have a booming population of pods, which is great! At least my bf days we can go shopping for this tank for my birthday! I'm glad he's so supportive *cough, enabler, cough*. He lets me drag him to the LFS on a weekly basis and even helps my carry the water jugs. He's a keeper for sure! I just ordered a Halimeda sampler pack, codium, and red algae pack from live-plants.com, so that will be coming sometime this week. I'm really excited to get it 'planted'! I still haven't gone to the fish store to get the gorgonian I was interested in. My magenta shrooms is getting quite big. I'm hoping the new macro will reduce the amount of algae, both hair and cyano. I just ordered a Halimeda sampler pack, codium, and red algae pack from live-plants.com, so that will be coming sometime this week. It's funny; GCE's red algae and Halimeda samplers were the first things I put into my own aquarium after the live rock. 😄 Great minds think alike! That is funny! 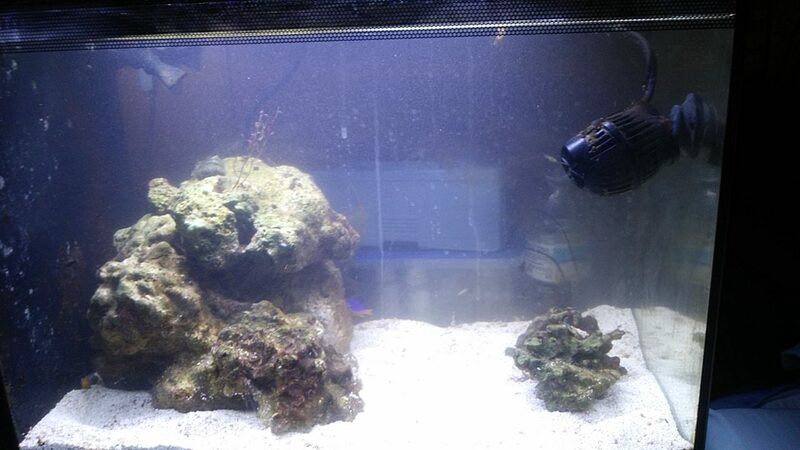 I hope it fills the tank put nicely, I'm hoping to add some rics and gorgs, then add my pipefish and let it grow in.